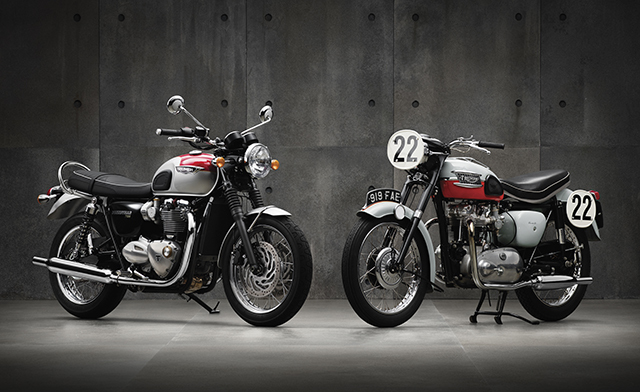 The new Triumph Bonneville T120 and T120 Black is the go-to duo for the traditionalist who loves the original T120 that took the world by storm all those years ago. 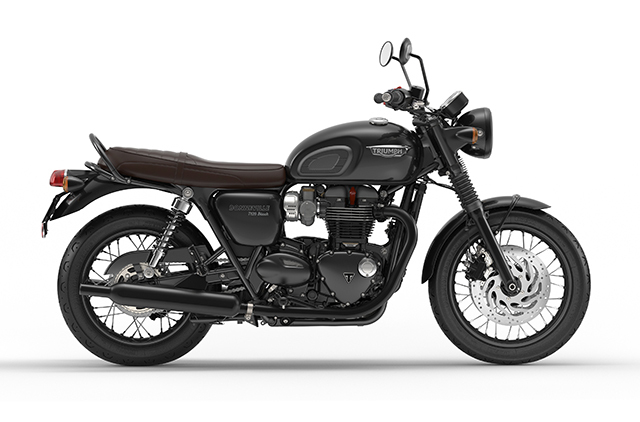 It perfectly balances the iconic looks and elegance of the 1959 classic and adds modern touches like ABS, integrated heated grips, traction control, ride by wire and a slip assist clutch so smooth you can operate it with one finger. It’s an incredible achievement for Triumph to have maintained all of the authenticity of the original while adding features like dual rider modes and USB charging that only top shelf modern bikes have offered previously. 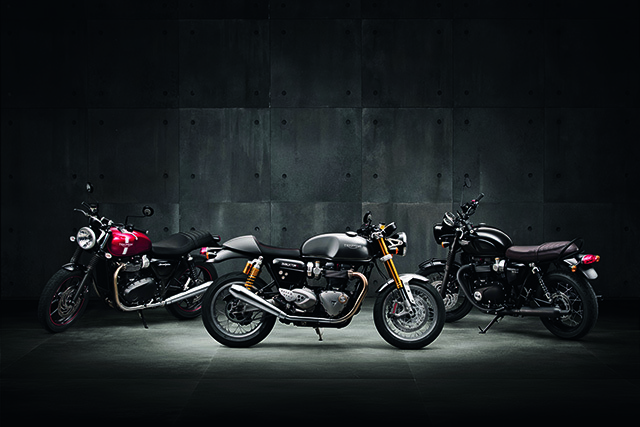 Just how you customise your new Bonnie now has a whole new dimension with the addition of “Inspiration Kits” for each new motorcycle allowing you to ride off the factory floor in a style all of your own. 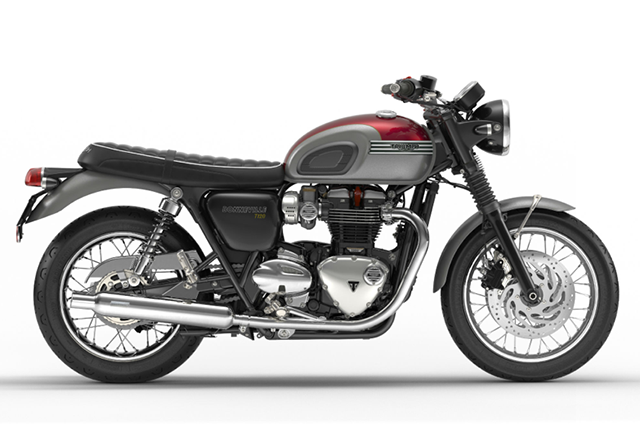 Of course, this won’t limit the thousands of workshops and builders around the world creating their own unique Bonneville’s, but what it will do is provide a huge parts list that will make that task easier and with Triumph’s own customs raising the bar you can expect builders around the world to take up the challenge of going one better. 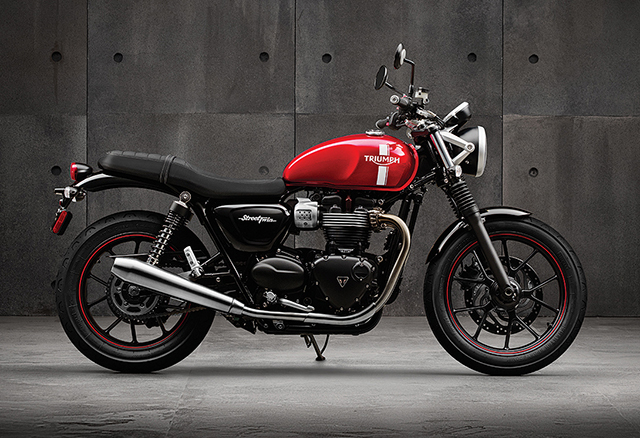 The Street Twin offers three inspiration kits and Triumph have done an exceptional job at tailoring these packages to the latest trends which just happen to be some old school favourites. The Scrambler inspiration kit creates an off-road, go anywhere style and with a parts list including a brushed high-level Vance & Hines exhaust system, rear fender removal kit with compact rear light, brown ribbed bench seat, brown ‘Barrel style’ handlebar grips, compact LED indicators and brushed aluminium sump guard. The Brat Tracker kit is the aggressive version for the urban warrior taking many of parts from the Scrambler kit but adding a Black ribbed bench seat and black ‘Barrel style’ handlebar grips for that murdered out look. 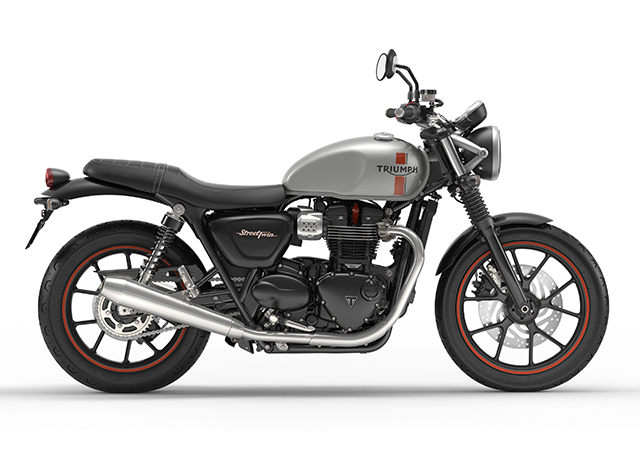 While the Urban kit is all about the café look and doing it in style – ‘Ace’ style handlebars, brushed Vance & Hines slip-on silencers, compact LED indicators, short tinted flyscreen, signature single pannier, in waxed cotton and leather. The Bonneville T120 have not been forgotten with an Inspiration kit of their own, known as the Prestige that delivers an authentic chrome ‘4 bar’ tank badge, ribbed and stitched black seat, compact LED indicators, chrome Vance & Hines peashooter slip on silencers, black ‘Barrel style’ handlebar grips, chrome clutch cover, alternator cover and throttle body embellishers. 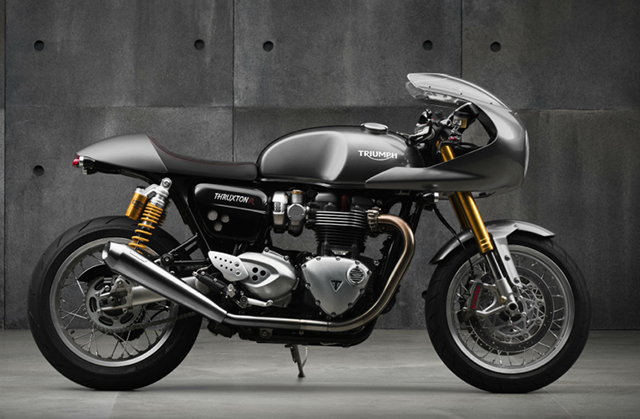 Completing the range is the Thruxton and Thruxton R models and it’s safe to say Triumph have delivered the best performing classically styled motorcycle of all time. 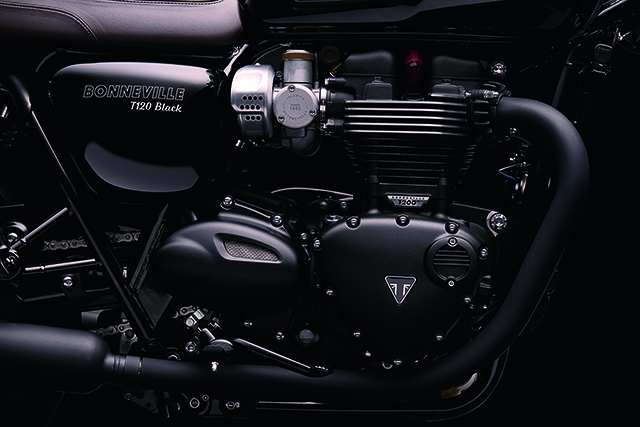 The heart of the beast is the all new 1200cc ‘high power’ 8 valve, parallel twin Bonneville engine. Lighter crank, higher compression, low inertia 6 speed gearbox, state of the art airbox and an array of rider assist modes help to deliver a thumping 112nm of torque, they’re Superbike numbers! To get an idea of just how far the Triumph engineers have developed the all new engine that’s Honda CBR1000RR torque figures at half the rpm. The R also benefits from brakes by Brembo, Suspension by Showa and Ohlins and sticky Pirelli rubber, imagine turning up at the Ace Café in the ‘60s on this bad boy! 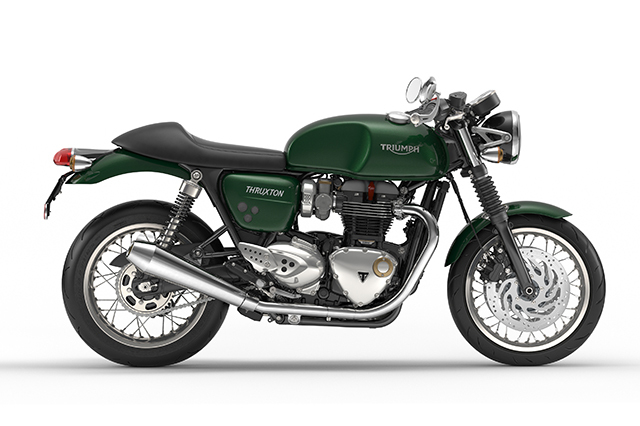 Both models also have the option of two inspiration kits of their own, the first is the sure-to-be-wildly-popular ‘Café Racer Kit’. 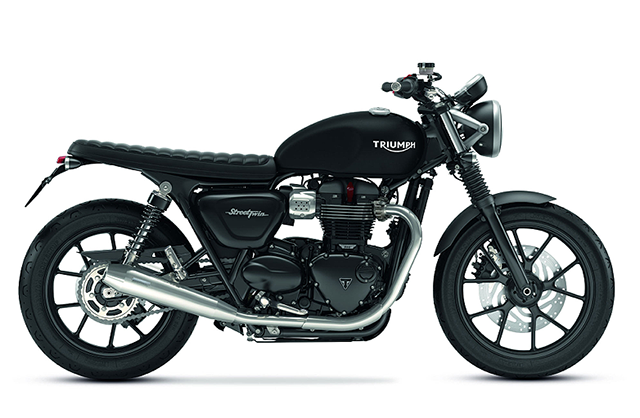 Featuring a rear fender removal kit with compact light, Vance & Hines exhausts, lower clip-on handlebars, short tinted fly screen, compact LED Indicators, single painted seat cowl (only for the Thruxton as standard already on Thruxton), signature Triumph rubber knee pads, knurled handlebar grips and a leather tank strap. 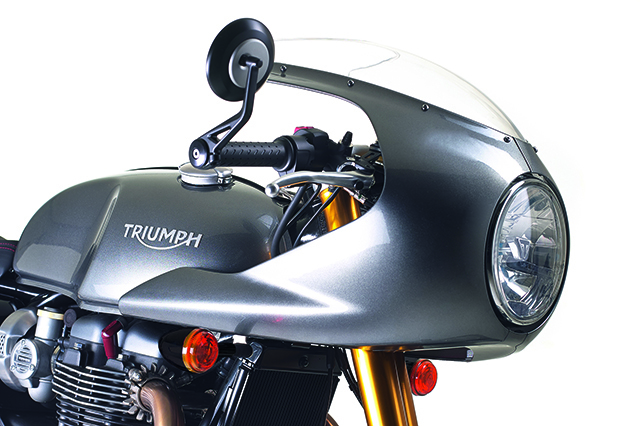 For the boy racer or the old TT warriors there is the ‘The Track Racer’ inspiration kit with sculpted cockpit fairing with lower clip-on handlebars, single painted seat cowl, rear fender removal kit with compact light, compact LED Indicators, Vance & Hines slip-on silencers, knurled handlebar grips, leather tank strap. And just when you think there couldn’t be any more, Triumph have announced a Performance Race Kit for the Thruxton R that has been specifically designed for competition use on closed circuits, more power, less weight and ready to take on the world in 2016. Damn. 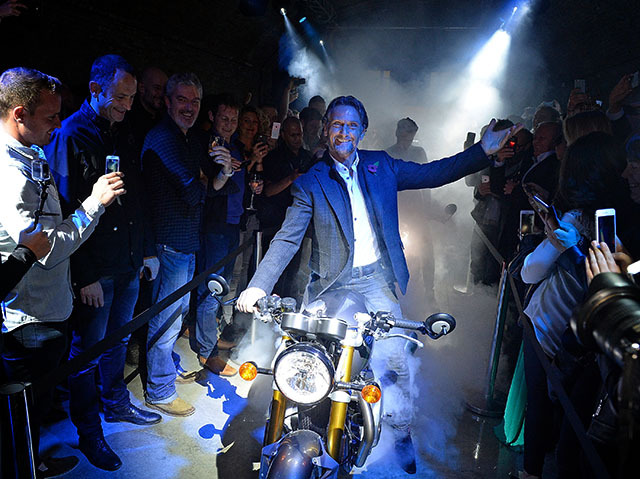 The fine print: In an effort to keep things as legit as possible, we feel it’s probably best to mention that Triumph Australia paid for our trip to London to see their new bikes. Rest assured that if the bikes weren’t up to scratch, we’d have no problems in saying just that, and that we will always endeavour to give you guys the best reviews possible without fear or favour; sponsors bearing gifts included.